We live in a digital world run by email and text messages, a greeting card sent through the mail can bring out a smile from the recipient and the sender. Custom greeting cards are great for any special occasion, including special announcements, thank you notes and so much more. The possibilities are endless. Printing a velvet card that's unique, with a personalized message will be remembered for a long time. These velvet greeting cards are sure to be attention grabbing while remaining firm and durable. 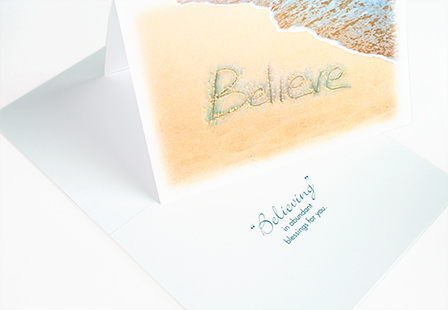 Select from a variety of options (scoring, slits, quantities) and sizes to make your personalized greeting card one-of-a-kind.